Africa’s potential as a growth market for business remains both underestimated and misunderstood—as does the potential for business to play a transformative role in solving the continent’s biggest challenges. Consider one question: How many companies in Africa earn annual revenues of $1 billion or more? Most global executives and academics we speak with guess there are fewer than a hundred. Many answer “zero.” The reality? More than 400 such companies exist—and they are, on average, both faster growing and more profitable than their global peers. Africa’s current population of around 1.2 billion people is projected to reach 1.7 billion by 2030. Africa’s real GDP grew at an average annual rate of 5.4 percent in 2000–2010, driven in nearly equal measures by labor force growth and productivity growth. After a slowdown prompted by the shocks of the Arab Spring in 2011 and the collapse of oil prices in 2014, Africa’s growth has recovered and its future prospects look buoyant. Two indicators from the World Bank underline the continent’s promise. First, of the 10 fastest-growing economies in the world in 2018, six were in Africa— with Ghana at the top of the world ranking. Secondly, in the World Bank’s 2019 Doing Business index, five of the 10 most improved countries are in Africa, and one-third of all reforms recorded globally were in sub-Saharan Africa. The economic acceleration and improving business environment are underpinned by five long-term trends, each of which is unlocking transformative growth in key economic sectors. Africa’s current population of around 1.2 billion people is projected to reach 1.7 billion by 2030. More than 80 percent of Africa’s population growth over the next few decades will occur in cities, making it the fastest-urbanizing region in the world. 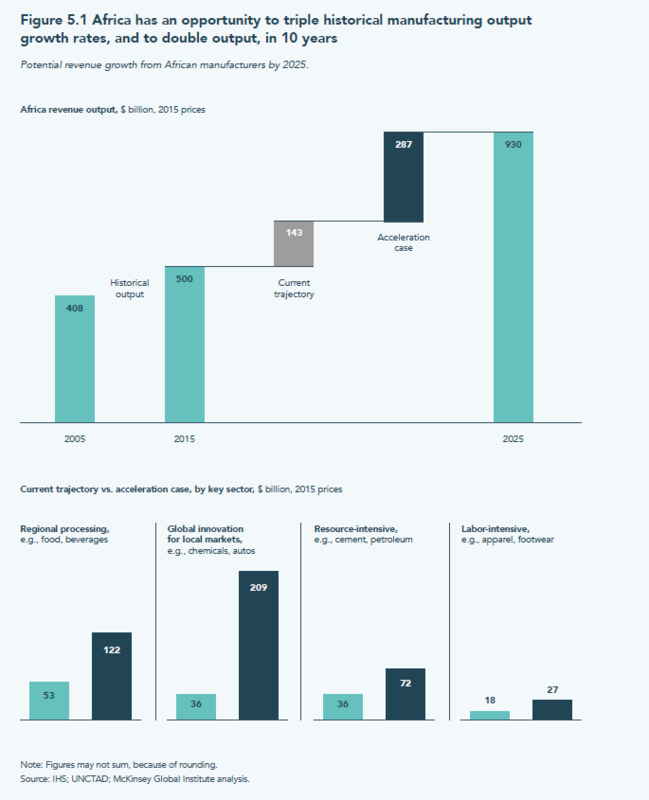 At the same time, incomes are rising across much of the continent, generating new business opportunities in the consumer market.2 In total, we expect annual spending by African consumers and businesses to reach $6.66 trillion by 2030, up from $4 trillion in 2015. These trends are spurring growing markets in a range of sectors where Africans have unmet needs, including food, beverages, pharmaceuticals, financial services, healthcare, and education. Poor infrastructure is one of the key impediments to investment and growth in Africa. For example, nearly 600 million Africans lack access to the electricity grid. But while Africa’s infrastructure still lags behind that of other developing regions, significant progress has been made: Africa’s annual investment in infrastructure has doubled to around $80 billion a year since the beginning of this century. That represents a big opportunity for investors and entrepreneurs with the imagination to help solve Africa’s infrastructure challenges. Africa has long been known for its resource abundance in both agriculture and mineral resources. To date, though, Africa has struggled to translate these resources into shared wealth and sustained economic development. New innovations and investments promise to change that picture and create exciting growth opportunities for business. For example, in oil and gas, Africa is rich in unexplored, high-potential regions, and the continent has huge unmet demand for energy. We estimate that the domestic gas market in Africa will grow by 9 percent a year to 2025, by which time the continent could use up to 70 percent of its own gas. Sub-Saharan Africa saw the world’s fastest rate of new broadband connections between 2008 and 2015, and mobile data traffic across Africa is expected to increase sevenfold between 2017 and 2022. Africa has more than 120 million active mobile money accounts, over 50 percent of the global total; this has leapfrogged many people over traditional banking products. This trend will allow companies to improve productivity, speed up transactions, and access wider markets, and could add $300 billion to the continent’s GDP by 2025. Africa’s 54 countries are diverse in terms of population, development levels, growth rates, and stability. While Nigeria has nearly 190 million people and Ethiopia and Egypt have over 90 million people each, most African nations have populations below 20 million. 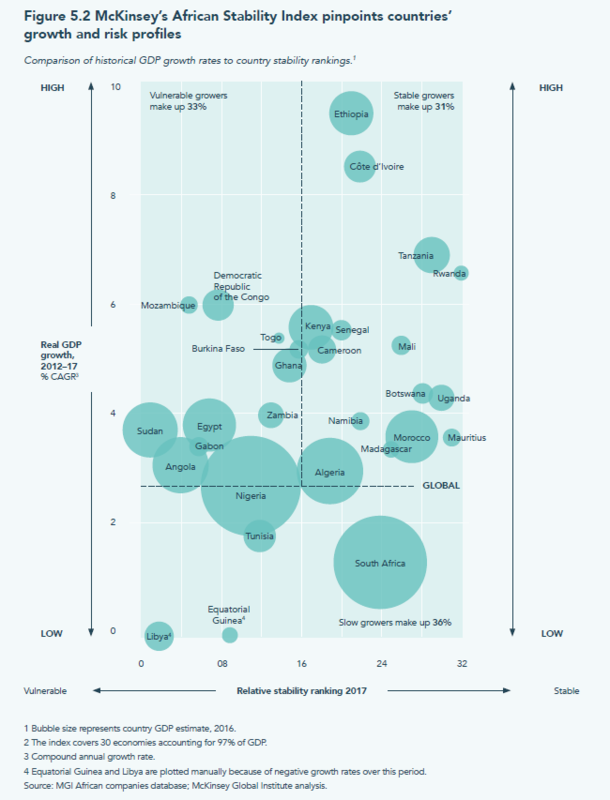 Likewise, nine countries make up three-quarters of Africa’s GDP, and in 2030 three countries will represent almost half of the household consumption on the continent: Nigeria (20 percent), Egypt (17 percent), and South Africa (11 percent). Many smaller countries, however, are growing quickly and increasing their share of continental GDP and consumption. We expect East Africa and Francophone Central and West Africa to increase their share of Africa’s overall consumption significantly. To serve a sizeable market, companies must therefore shape a coherent geographic portfolio with prioritized countries and cities of operation. We designed one tool, McKinsey’s African Stability Index, to support businesses and investors to balance their portfolios (Figure 5.2). Stable growers. These economies are relatively less dependent on resources for growth and are progressing with economic reforms and increasing their competitiveness. Vulnerable growers. These countries each have at least one of three types of vulnerability. Some, such as Angola and Nigeria, are heavily dependent on resource exports. Other countries, such as the Democratic Republic of the Congo, face security or governance challenges. Finally, countries such as Mozambique are vulnerable to macroeconomic difficulties. For investors, vulnerable growers offer promising growth potential, but they also pose risks that need to be properly assessed and understood. Slow growers. This group includes Libya and Tunisia, countries affected by the Arab Spring, and Africa’s second-largest economy, South Africa. Investors will need to assess growth opportunities at the sector level or use their activities as a base from which to expand into other parts of the region. We also encourage investors to think about Africa’s cities, not just its countries, as they construct their African portfolios. 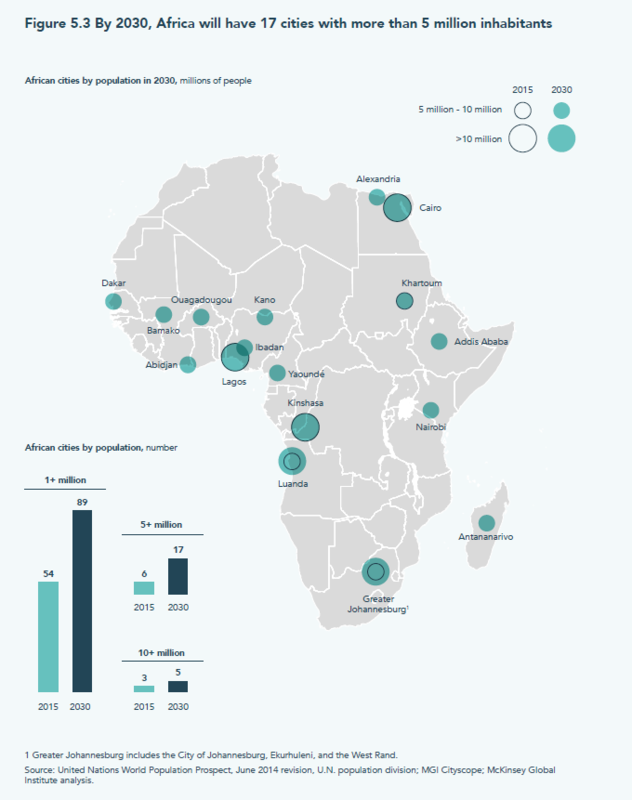 By the end of the next decade, Africa will have nearly 90 cities with at least a million inhabitants (Figure 5.3). Rapid urbanization6 is one good reason why companies should make cities a central focus of their African growth strategies. Just as important, though, is the fact that per capita consumption in Africa’s large cities is nearly double the average of these cities’ host countries. Although Africa’s successful firms differ widely in their geographic and sector focus, what they have in common is the imagination to see the continent’s unmet needs as opportunities for entrepreneurship, and the long-term commitment required to build businesses of meaningful scale. Indeed, the fastest growing and most profitable businesses in Africa typically see challenges as a spur for innovation. Successful African innovators are also deeply conscious of the barriers to their businesses’ success, and careful to build long-term resilience into their business models. Consider the example of Nigeria-based Dangote Industries, which manufactures commodities in massive volumes, and has made founder Aliko Dangote Africa’s richest person. Dangote has built a shock-proof manufacturing model through vertical integration of the supply chain, on-site power generation, robust engagement with government, and an internal manufacturing academy. For entrepreneurs ready to solve problems and innovate to meet Africa’s unmet needs there is tremendous opportunity for growth. For entrepreneurs ready to solve problems and innovate to meet Africa’s unmet needs there is tremendous opportunity for growth. One example is Paga, a Nigerian mobile money startup that has signed up more than 8 million users in less than a decade—and today, processes $2 billion a year in payments. Other innovative problem solvers include Viola Llewellyn, Joe Huxley, and Adam Grunewald. Africa has room for many more such entrepreneurs and investors. We hope you will be one of them. Acha Leke et al., “Africa’s Business Revolution: How to Succeed in the World’s Next Big Growth Market” (Harvard Business Review Press, 2018), Landry Signé, “Capturing Africa’s High Return” (Brookings Institution. March 14, 2018), and Landry Signé, “Africa Booming: Winning during the Fourth Industrial Revolution” (tentative title) (forthcoming, Brookings Institution Press, 2019). Landry Signé, “Africa’s Consumer Market’s Potential: Trends, Drivers, Opportunities, and Strategies.” 2018. Brookings Institutions’ Africa Growth Initiative Report. Landry Signé, “The Potential of Manufacturing and Industrialization in Africa - Trends, Opportunities, and Strategies.” 2018. Brookings Institutions’ Africa Growth Initiative Report. Landry Signé, “Africa’s Tourism Potential: Trends, Drivers, Opportunities, and Strategies.” 2018. Brookings Institutions’ Africa Growth Initiative Report. John Page, 2018 and Brahima Coulibaly, 2018.